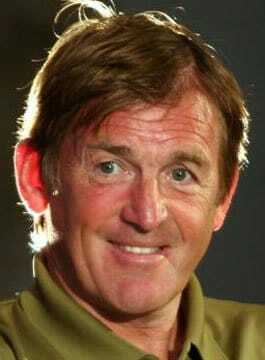 Sir Kenny Dalglish MBE is a Legendary Liverpool Player and Manager. There can only ever be one ‘King’ and the man who’s earned the right to take his place on the Anfield throne is the one and only Kenny Dalglish. Regarded by the majority of Liverpudlians as the club’s greatest ever player, his all round stunning brilliance has been deemed to have shaken the Kop more than anyone else. Born in Glasgow, March 1951, Kenny Dalglish played in the Scottish International Under 15’s team, before signing for Celtic in 1967, making his first team appearance in September 1968, and becoming the team’s captain in 1975. Dalglish had been a full Scotland International for 6 years by the time he decided to leave Celtic in 1977. After 269 appearances, and 167 goals for the Hoops, Kenny moved to Bob Paisley’s Liverpool for a record £440,000 transfer fee. When he joined the club it was hard to see how Liverpool could top their first European Cup triumph of the previous season, but with the highly influential Dalglish in the team the next 13 years were to bring a succession of untold riches. The Scotland international was brought in to replace the recently departed ‘Kop idol’ Kevin Keegan, who’d moved to Hamburg earlier that summer. Dalglish scored within seven minutes of his league debut for Liverpool, against Middlesborough at Ayresome Park, and was followed by scoring again within the first minute on his first appearance at Anfield three days later as Newcastle were beaten 2-0. At the end of his first season, Dalglish had played 62 times scoring 31 goals. These included the winning goal in the 1978 European Cup Final at Wembley against FC Bruges. He went on to become arguably the most influential member of the most successful club team in English football history, winning further League Championships and European Cups in a period stretching to the late 1980s. During the 70’s and 80’s Dalglish played for Scotland in both the 1978 and 1982 FIFA World Cups. In total, he played 102 times for Scotland (a national record) and scored 30 goals (also a national record, shared with Denis Law). His supreme individual ability was recognised by the Football Writer’s of England who voted Kenny their ‘Footballer of the Year’ in 1979 and 1983. In the aftermath of the Heysel Stadium disaster 1985, and in the wake of the resignation of Manager Joe Fagan, Dalglish was a surprising, but popular appointment as Liverpool’s player/manager. As manager, Kenny guided the team to the club’s first ever ‘double’ in 85/86, clinching a coveted League and FA Cup double, with Dalglish scoring the goal that secured the title. What Dalglish went on to achieve as Liverpool manager cemented his legendary status, but he did more than enough during his playing career to be rightfully hailed as the greatest player in Liverpool history. In 1991, Kenny moved to Blackburn Rovers whom he led into the English Premier League. After winning the Premiership, Dalglish became Blackburn’s Director of Football, before heading to Newcastle United in 1997 replacing the departing Kevin Keegan as Manager. He guided the Magpies to the thirteenth spot in the Premiership in his first season, before he was appointed as Director of Football at Celtic. In February 2000, Kenny Dalglish was appointed caretaker manager at Celtic until the end of the season, he guided the club to the Scottish League Cup Final where they beat Aberdeen 2-0 at Hampden Park. He left the club shortly after, paving the way for Martin O’Neill. In 2011, Kenny returned to the Kop as Liverpool’s manager. Dalglish led Liverpool to their first trophy in six years, with victory in the 2011–12 Football League Cup. In the same season he also led Liverpool to the 2012 FA Cup Final before leaving the club in 2012.